Write a letter to your bank informing them of your travel and that they must make your ATM open in the country travelling to. I am writing this letter to inform you that I am travelling to France in 2 days. According to bank policy I cannot use my ATM without informing bank. Therefore, I am requesting you to authorize me the usage of ATM card for the said country. It will be kind of you if you also extend the monthly usage limit on my account. I shall be very thankful to you. I will be going abroad on a trip to Malaysia on October 18th, 2018. I will be making financial transactions while I am there. Therefore I request that my debit card be enabled for overseas use from the 18th until my scheduled return to France on the 31st of October, 2018. I sent this letter to request to kindly activate my ATM card for overseas use. I was trying to make an international payment last week for my daughter’s university application; however it was continually being blocked by the bank. I called the helpline and they told me that the international payments can only be activated by the bank and not through helpline. She is close to meeting her application deadline so I would appreciate if you will approve my request as soon as possible. If there is any other document required for the activation, you may contact me and let me know. Sample Letter to Bank Manager for Unblock ATM Card. ATM card activation letter format. A letter to bank manager for ATM card missing. A letter to bank manager for ATM card expired. Kindly refer to the subject as cited above. It is to inform you that I am an account holder in your bank since 2000. Last night I was to have performed cash withdrawal transaction from ATM machine. I tried many times but couldn’t get desired amount. Meanwhile, the machine began to display message of “Blocked Card”. It is therefore requested to please unblock my ATM card so that I could withdraw the desired amount from anywhere and anytime. I would appreciate you immediate attention to this matter. I happened to have my ATM card blocked last night for some unknown reasons. Due to this, I am having trouble with my every day transactions. It is informed to you that this ATM card (no. 12345) is for my main account (no. 9876) and I use this for my regular business routine. It is very hard for me to arrange an alternative immediately. Hence it is requested that my ATM be unblocked immediately so that I can continue my everyday work. I am Tahir Malik, resident of Faisal town. I have opened an account in your bank few months ago, and i got an ATM card last week through a courier service. This ATM card is blocked by the bank, i do not know either it is because of wrong password or what is the reason. I cannot use it anyway. I have asked to the bank to check it out for me or tell me how to unblock it. They told me to write to their bank manager about this problem, so here i am. Kindly take a notice and unblock my ATM card so i can use it for further transactions. It is stated that I requested you to block my ATM Card’s transactions a week ago just because I lost it and didn’t want anyone to misuse it. However when I was moving my furniture around today I found it! It’s totally operational but my transactions are still blocked. I am writing this letter to request you to kindly unblock my ATM Card effective immediately. I am attaching my digital signatures along with this letter ensuring you that this ATM Card is indeed mine. 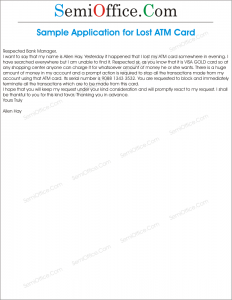 An application letter to bank manager to inform about the lost ATM card, Visa Card, Master Card, Credit Card to bank in order to cease all the transactions from lost card. 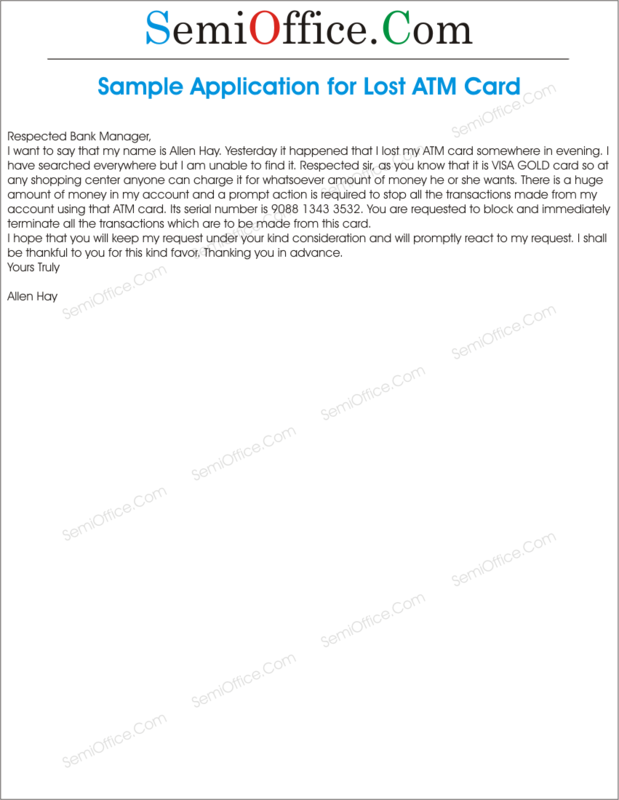 This application is to inform a lost ATM card. I have lost my ATM card somewhere in boarding to a flight. i request the bank to block any such transaction been initiated on my ATM card. I have also filled an application to the police station for such lost card. I also want to request the bank to issue a new ATM card. I acknowledge that its fees can be deducted directly from my account. Please be informed that two weeks ago on 5th August, 2015 I had opened a savings bank account number 0033-123456789 at your branch. My account name is Umar Shahzad. My contact number is 0300-1234567 and my residential address is A-Block, Commercial Area, DHA, Phase 1, Lahore. Kindly issue me my ATM card. Your assistance in this regard will be highly appreciated. It is stated I am account holder in your bank from last two year. But sir I have lost my ATM card few days before, so I want to request for a new one. I have an urgent need of atm card this time, so sir kindly issue me new atm card as soon as possible. I shall be thankful to you. I want to say that my name is Allen Hay. Yesterday it happened that I lost my ATM card somewhere in evening. I have searched everywhere but I am unable to find it. Respected sir, as you know that it is VISA GOLD card so at any shopping center anyone can charge it for whatsoever amount of money he or she wants. There is a huge amount of money in my account and a prompt action is required to stop all the transactions made from my account using that ATM card. Its serial number is 9088 1343 3532. You are requested to block and immediately terminate all the transactions which are to be made from this card. I hope that you will keep my request under your kind consideration and will promptly react to my request. I shall be thankful to you for this kind favor. Thanking you in advance. I am Raynah Qasim, CNIC 3502-1234567-8. I’ve recently opened a savings account at your bank branch on 12th August, 2015. My account number is 0033-999999999. Please issue an ATM card for my account. Enclosed with this letter is a copy of my CNIC. Kindly activate my mobile phone services with ATM and deliver the card at the above mentioned address. Dear Sir it is intimated that I am holder of bank account having No.563786547673 in your branch. ATM Card facility was also provided to me against my above mentioned account. It required to be brought into your notice that a few days ago I lost my ATM Card having Code No.13458754534445 in the Commercial Market somewhere and after thorough search could not find it out. Due to loss of my ATM Card I am facing difficulties in my daily routine and therefore want its replacement. It is therefore requested that a new ATM Card may please be issued to me. An early action is requested please. The services delivered by the branch have been satisfactory and no problems or delays have been faced by me against any service. In the past week, I was going for a meeting at PSO office, Mall Road, Lahore; and unfortunately I misplaced my wallet somewhere outside the office. In my wallet I had my money, ID card, and my ATM card of the respective bank. I have complained regarding the loss of my cards as they are sensitive as according to the current situations of the society. The police cooperated with me with respect. I Request the branch to take into account, that I lost my ATM card and provide a provisional allowance or another card so that I am able to utilize the services and continue my transactions from the bank. It is important as my business is running at a pace and i have to travel between cities to continue my job. Awaiting for your Response! With all my due respect I would like to tell you that I have lost my wallet in the bus last week, there was my ID card, ATM card along with some cash. I request you to issue me a new ATM card on urgent basis as my job are related to travelling and I cannot carry cash with me at least after this unfortunate incident. I need it on urgent basis so a quick response would be appreciated. Thanks a lot.